One of the most profound paradigms that have transformed our understanding about life over the last decades was the acknowledgement that microorganisms play a central role in shaping the past and present environments on Earth and the nature of all life forms. Each organism is the product of its history and all extant life traces back to common ancestors, which were microorganisms. Nowadays, microorganisms represent the vast majority of biodiversity on Earth and have survived nearly 4 billion years of evolutionary change. Microbial evolution occurred and continues to take place in a great variety of environmental conditions. However, we still know little about the processes of evolution as applied to microorganisms and microbial populations. In addition, the molecular mechanisms by which microorganisms communicate/interact with each other and with multicellular organisms remains poorly understood. Such patterns of microbe-host interaction are essential to understand the evolution of microbial symbiosis and pathogenesis.Recent advances in DNA sequencing, high-throughput technologies, and genetic manipulation systems have enabled studies that directly characterize the molecular and genomic bases of evolution, producing data that are making us change our view of the microbial world. The notion that mutations in the coding regions of genomes are, in combination with selective forces, the main contributors to biodiversity needs to be re-examined as evidence accumulates, indicating that many non-coding regions that contain regulatory signals show a high rate of variation even among closely related organisms. Comparative analyses of an increasing number of closely related microbial genomes have yielded exciting insight into the sources of microbial genome variability with respect to gene content, gene order and evolution of genes with unknown functions. Furthermore, laboratory studies (i.e. experimental microbial evolution) are providing fundamental biological insight through direct observation of the evolution process. They not only enable testing evolutionary theory and principles, but also have applications to metabolic engineering and human health. Overall, these studies ranging from viruses to Bacteria to microbial Eukaryotes are illuminating the mechanisms of evolution at a resolution that Darwin, Delbruck and Dobzhansky could barely have imagined. Consequently, it is timely to review and highlight the progress so far as well as discuss what remains unknown and requires future research. 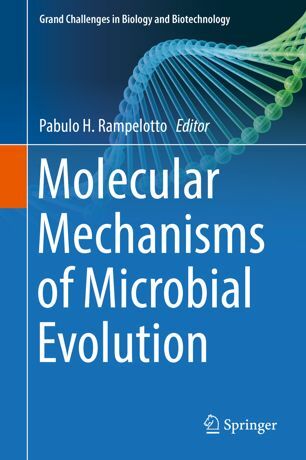 This book explores the current state of knowledge on the molecular mechanisms of microbial evolution with a collection of papers written by authors who are leading experts in the field. 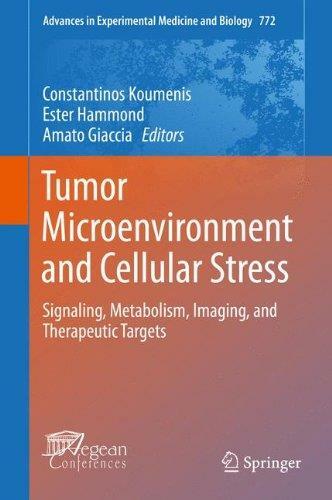 The collection of chapters in this proceeding volume reflects the latest research presented at the Aegean meeting on Tumor Microenvironment and Cellular Stress held in Crete in Fall of 2012. 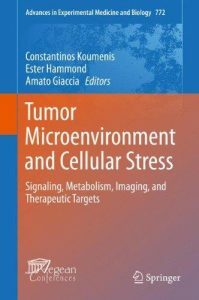 The book provides critical insight to how the tumor microenvironment affects tumor metabolism, cell stemness, cell viability, genomic instability and more. Additional topics include identifying common pathways that are potential candidates for therapeutic intervention, which will stimulate collaboration between groups that are more focused on elucidation of biochemical aspects of stress biology and groups that study the pathophysiological aspects of stress pathways or engaged in drug discovery. Breaks new ground in explaining the breakthroughs possible with therapeutic microbiology. Explores the potential and actual uses of the many methods for altering the microbiotas of humans and animals: probiotics, prebiotics, synbiotics, bacteriophages, and replacement therapy. 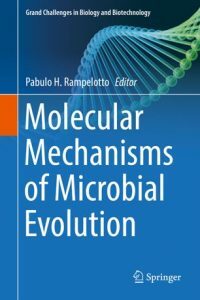 Describes the biological principles underlying the manipulation of the indigenous microbiota and the biology of the effector organisms that have been utilized for this purpose. 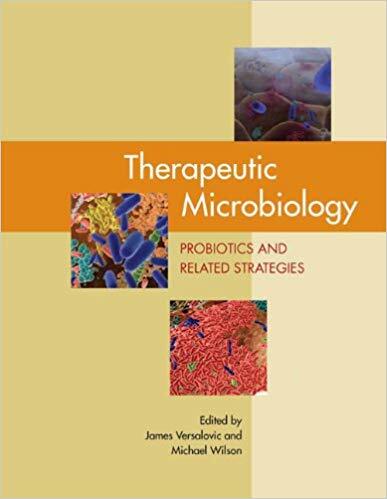 Discusses the many microbes that can potentially be used therapeutically and prophylactically. Serves as a reference to medical, dental and veterinary practitioners with an interest in alternative approaches to the prevention and treatment of microbial diseases. 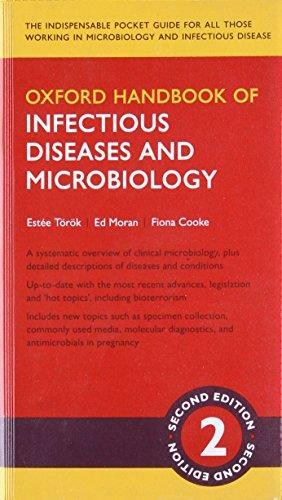 Encompassing twenty-four clinically important and frequently encountered infectious diseases, the text provides all the necessary background and the most up-to-date treatment of the microbes that cause diseases in humans. Each fully illustrated case study is introduced with a patient history, differential diagnosis, clinical clues, laboratory data, pathogenesis, treatment, and prevention. Presented as unknowns, the cases challenge readers to create a differential diagnosis just as they would in practice, including noninfectious causes that could present similar clinical findings. 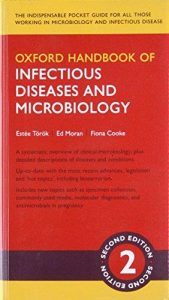 Fully reviewed and revised for its second edition, the Oxford Handbook of Infectious Diseases and Microbiology maintains its position as the must-have guide to all aspects of infectious diseases and microbiology. Reflecting the current approach to joint postgraduate training programmes, the handbook takes an integrated approach to both subjects. 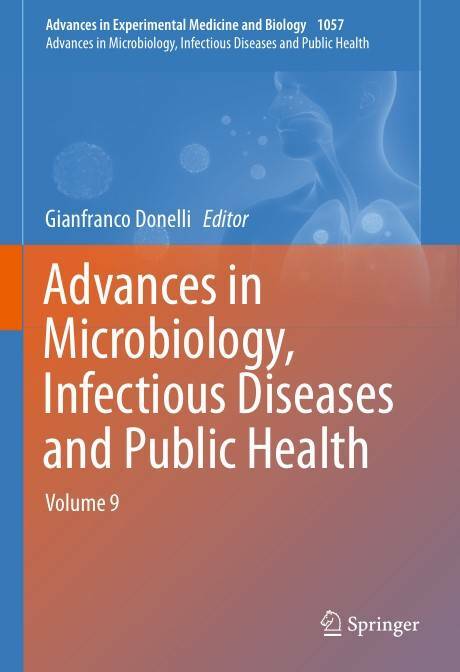 It covers the basic principles of bacteriology and virology, along with specific guidance on individual diseases and conditions, all in the accessible Oxford Handbook style. Now including new topics on important subjects such as microbiology specimen collection, commonly used media, molecular diagnostics, and antimicrobials in pregnancy, as well as incorporating new guidelines from WHO, NICE, and BASHH among others, this handbook ensures that the informaiton you need is accessible, clear, and easy-to-understand.Practical and comprehensive, this handbook includes coverage of National Frameworks and current legislation, together with information on topical issues such as bioterrorism and preventative medicine. Fully reviewed by specialist senior readers, and with useful links to up-to-date clinical information and online resources, this is an important addition to the Oxford Handbook Series. 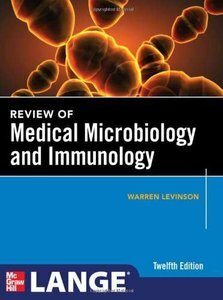 Essential for USMLE and medical microbiology course exam preparation, Review of Medical Microbiology, 12e provides a high-yield review of the basic and clinical aspects of bacteriology, virology, mycology, parasitology, and immunology. 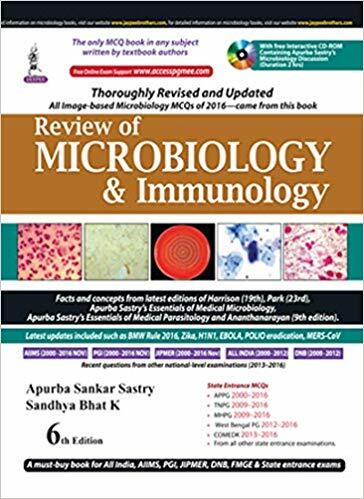 • Enriched with new information to keep abreast with latest development in medical microbiology, pandemic of swine flu outbreak, biofilms, new methods of sterilization and disinfection, Ogawa medium, latest immunological tests in Mycobacterium tuberculosis, Napah virus, etc. • Parasitology and entomology especially incorporated. 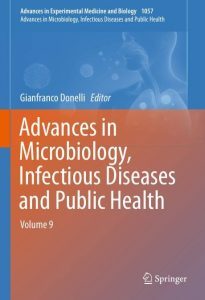 • Addition of four new chapters, namely Microbiology in the Service of Human Being, Molecular Techniques in Microbiology, Emerging and Re-emerging Microbial Diseases and Hospital and Laboratory Wastes. 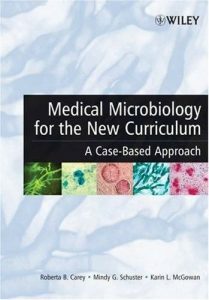 • Clinical microbiology and applied microbiology is targeted to all the medical fraternity especially the students of Medicine and Dentistry. • Presentation of 10th edition enlarged, thoroughly revised and handy text in elegant and colourful form. 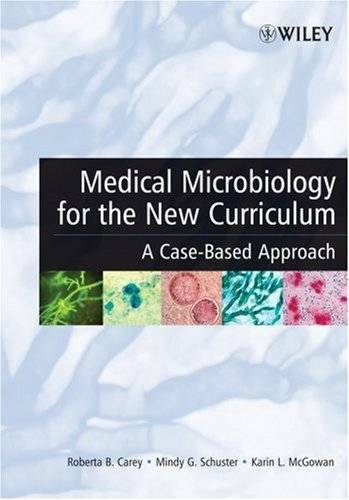 • The only MCQ book in any subject written by textbook authors. 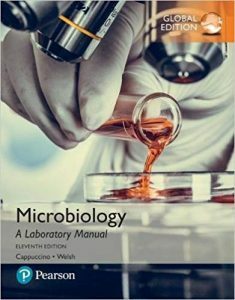 • All image based microbiology MCQs of 2016 came from this book. 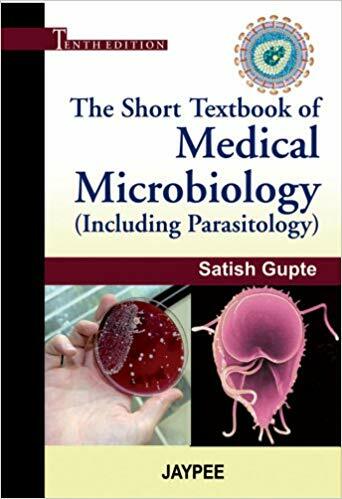 • Facts and concepts have been taken from latest editions of Harrison (19th), Park (23rd), Jawetz (25th), Apurba Sastry’s Essentials of Medical Microbiology, Apurba Sastry’s Essentials of Medical Parasitology and Ananthanarayan (9th edition). • Latest updates included such as BMW Rule 2016, Zika, H1N1, Ebola virus, Polio eradication, Vaccine-derived PolioVirus (VDPV), MERS CoV, etc. • Includes questions along with explanatory answers of AIIMS (2000-2016 Nov), PGI (2000-2016 Nov), JIPMER (2009-2016 Nov), All India (2000-2012), DNB (2000-2012) and recent questions from other national level examinations (2013-2016). • Contains recent MCQs from state entrance exams such as APPG (2000-2016), TNPG (2009-2016), MHPG (2009-2016), West Bengal PG (2012-2016), COMEDK (2013-2016), CMC Vellore 2016 and latest MCQs from other national and state entrances. • Image-based question bank is strengthened with new images (more than 500 images are included). • Only MCQs book on Microbiology written by the subject specialty and textbook authors. • Interactive 2 hours DVD containing Apurba Sastry’s Microbiology Discussion. • Chapter-wise concise text in a new layout for enabling students to study antegrade manner and important points given in separate boxes. • Chapter-wise MCQs with detailed explanations given from previous year exams of National and State exams including DNB and NEET pattern questions. • Hundred percent authentic and correct answers with updated references. • More emphasis is given to the sections, like Immunology, Parasitology and Mycology. • Enriched with lots of tables, flowcharts and mnemonics for better recall by the students. • Useful for interns, students preparing for entrance exams and for second professional students. • Author online support for clarification of doubts. • A must-buy book for All India, AIIMS, PGI, JIPMER, DNB FMGE and state entrance exams.